CONICET researchers evaluate criteria and recommendations for the cities located on the Buenos Aires coastline to be sustainable and to reduce the impact of tourism. 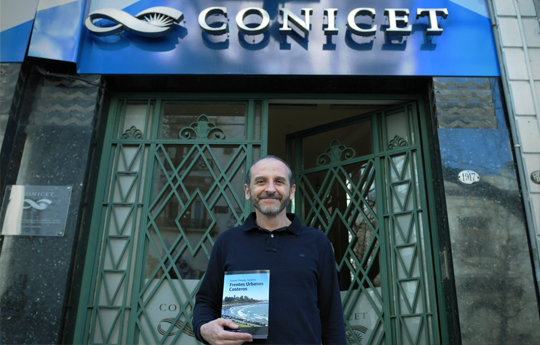 José Dadon is an independent researcher of CONICET, and author of the book City, Landscape, Tourism: Urban fronts of the coast. For this book, he worked together with a multidisciplinary team and planned and designed strategies to face current and potential troubles related to environmental and human factors. How do you diagnose whether a city is sustainable or not? We carry out extensive research into its entire costal front. We go round the place and take photographs of each lot, study what type of plants are there in each park, each pavement, each garden, and on the dunes. With a multidisciplinary team integrated by architects, urban planners, environmental engineers and botanists we analyze how the morphology of the beach is, what indicators of erosion are there and what environmental problems are identified. We study the fronts from an architectural point of view, the distribution of the population and how the city is waterproofed. Besides, the team evaluates if there are flooding problems and they integrate all those aspects to see what the major conflicts are. Which would be the design for an efficient coastline city? Our team thinks about a more compact tourist city that allows reducing the environmental impact. We consider the idea of low buildings, at least 30 metres away from the coast for everybody to overlook the sea and avoid the shadow of the buildings on the beach. The streets should not be asphalted except some avenue or diagonal to avoid flooding. When the streets are waterproofed, the water ends up going to the sea eroding the beach. Groundwater should be allowed to be refilled. Almost all these coastline cities need water because groundwater layers are depleted. What is the environmental impact of the urbanization of tourist cities? There are several. Building implies modifying the landscape. The vegetation, such as pine trees and eucalyptus, are not local. The urbanization moves away shorebirds and consequently, sparrows and doves proliferate. In general, we have flat and windy beaches where dunes are the main attraction. For this reason, it is important to keep natural areas protected, with dunes and paths that provide sand to the beach and work as sand reservoirs. Besides, there should be more greenhouses and natural areas to diversify tourist offers. There are many bird and vegetation reserves in coastal municipalities such as Punta Rasa, Miramar or Necochea. It would be a good idea for all the cities devoted an area to the conservation of biodiversity. What measures can be adopted by tourists and citizens to collaborate with the sustainability of coastal cities? They should not build tile pavement or gardens or waterproof them. Preferably, they should construct high buildings that comply with the regulations, instead of occupying more ground. They shouldn’t claim for asphalt. As regards the beach, people need to learn to adapt to the environment and not demand unnecessary urban services such as a hairdresser salon near the coast. It is essential to value natural landscape: people should interact with the sand and the sea, without considering it as place where they can go with their four runners or ride their four wheelers for they are very destructive because they eliminate the dunes. What customs have been modified from the investigations carried out with your working team? We are trying to work with the municipalities. Our work is basically applied and we are committed to implementing the theory. We drew up the basic guidelines for the beaches, which has now become a law. They are a group of instructions for the owner of the resort or the concessionaire. Can I use a bulldozer? Can I build a concrete building? No. Do the restaurants and the changing rooms have to be made of wood or recycled material? Do they have to be removable? They do not have to be on the beach but on the stilts, which have to be removed at the end of the season and the toilet and shower drains should not go to the beach. José Dadon is an independent researcher of CONICET and director of the Research Centre of Coastal Spaces Administration (GEC) of the University of Buenos Aires.